While your period is supposed to be a “blessing” from the creator, women see it as the time of month when they feel HORRIBLE. If you’re in menopause, don’t think you are exempt! Sure, you may not have the monthly cycle, but research shows that the influx of hormones still occurs. The moodiness, tired, bloated, aching joints can interfere with your routine and throw you off track. To keep you going strong, here are some fitness tips on exercise and your period. Hydrate – Your period will zap your fluids. That is part of the reason women drag around and feel lousy. Make sure you are intaking plenty of fluids and also electrolytes. Supplement – You’ve heard this before, but iron is depleted during your menstrual cycle due to blood loss. As you lose fluid your body is fighting to restore red blood cells which can also cause lethargy. If you are feeling extra low, pick up some iron that is gentale on your stomach. My favorite brand is Solgar Chelated Iron, gentle on your stomach formula. MAG UP – Magnesium is a huge factor during your period. Being low in this mineral will also make you crave CHOCOALTE. Skip the snikers and take between 500- 1000 mg at night. It will sooth your achy joints, keep you away from sweet treats and keep you regular. Ditch the Junk Food – Craving are a sign of your period but they are also a sign of vitamin deficiency. Don’t forget your multivitamin in the AM! Take it easy on yourself. Use low intensity workouts for a shorter amount of time. Research shows that while on your period, you are burning another 300 calories per day. It’s no wonder you’re tired and hungry!! Don’t hit your high intensity class and sweat out the pain. Instead opt for a lighter workout. Exercise Soothes Cramps – Think of cramps as the devil and exercise as the the angels. 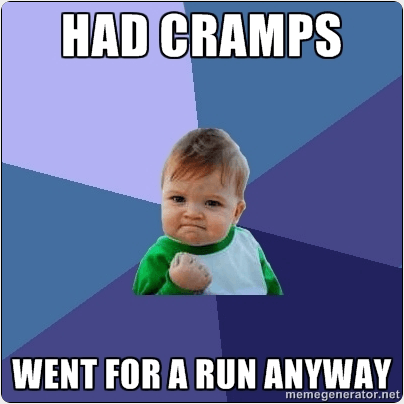 Cramps are reduced and even relaxed while exercising. So if you can get through the front doors of the gym you are already half way to lessening your pain. Yoga – Forcing your body to relax is a useful tool during this time of month. Instead of curling up in a ball on your bed, try going to a class to relax and rejuvenate. Track Your Cycle !! Not everyone is regular, and exercise and body fat loss can alter your monthly. 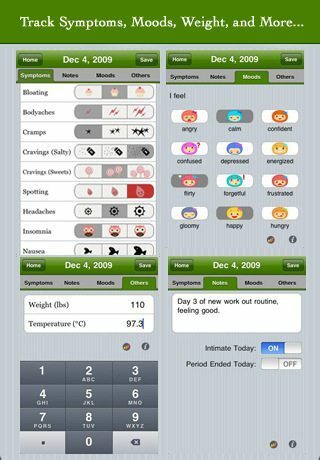 I use an app to track my periods so I know why I am feeling the way I do. Period tracker allows you to take notes, and gauge the symptoms of your cycle. What app are u using? Thankx!